The more I’ve worked with petite women (under 5’4″ tall) I’ve found that there are some elements that make a huge difference to how they appear. 1. Keep garments simple and uncluttered and small to medium in scale. Large patterns will swamp your frame, big collars will make you look smaller. Keep the scale of your garments in proportion to your height and weight. 2. Avoid too much fabric. Lots of extra fabric such as in waterfall cardigans or jackets, will overwhelm you. You are best in a more slim, formfitting line rather than lots of gathers, pleats and volume. 3. Shoes matter. You are best in a low vamp shoe, and in a shoe colour that either blends with your trousers, tights or legs. Knee high boots are a fabulous option for you. 4. A column of colour is your best friend. Keeping the line of colour unbroken will really elongate your frame. Dresses are fabulous for you as they do that in one garment. Keep your dresses to either knee length, or go maxi, but remember if you go maxi, not too much fabric, a lean fluid line is what you require. 6. Only one focal point. Tall women can carry off multiple focal points. You are a smaller canvas, so one focal point at a time, but make sure you have one to direct the eye to where you want the focus of your outfit to be. Want more petite tips? Why not pick up a copy of my ebook Never Short on Style: Dressing and Finessing the Petite Frame – it will be delivered instantly to your inbox! what an informative post. I am guessing the exact opposite applies to all of us tall ladies?! Again wonderful post. What about the XXL woman? Yes, very informative post. I was considering buying this book, but there was no information what defines ‘petite’. Now it’s clear. I’m just under 5’4″ and I’m looking forward to more of your great tips Imogen. I’m buying the book. I knew most of this, but the tip about avoiding waterfalls is really helpful. Between this post and neutrals for cool blondes, I feel fully armed! Thanks so much for your fabulous blog! 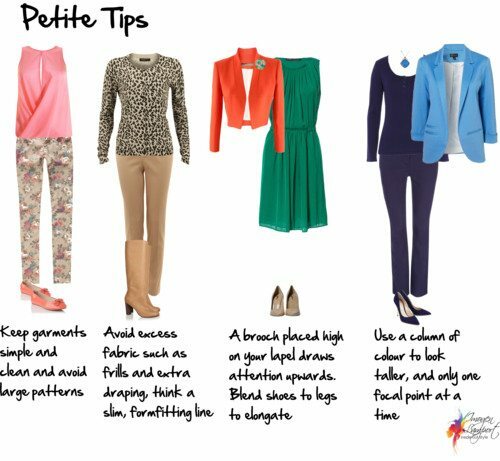 Another tip I read in a magazine once is if you are petite and like to wear a heeled shoe have your pants tailored so the hem ends where the heel begins. When someone can’t see how tall your heel is the extra height is considered to be your own. It doesn’t have to be a supier tall heel either. I generally wear a 3′ heel. I’ve had really great success with this. So much so that the first time I wore ballet flats into the lab everyone commented they had no idea I was as short as I really am. Thanks for the tips. What I find very frustrating is that so much of petite clothing is cropped or shrunken, with cropped trousers, 3/4 length sleeves and cropped jackets, even for my very short height. It’s actually more difficult than it should be to find normally-cut clothes and create that long column of color. It would seem then that the answer would be to wear average-size clothes, but petite sizing is even more about the cut of the shoulders, placement of the waist and rise of the trousers than just the length. Why must all petite clothing be cropped and “cute” rather than professional and/or modern? It is very challenging to find small sizes in normal cuts. Usually I will start with the pants… find the right fit and unless it’s denim, it’s obviously easy and cheap to get them hemmed… usually don’t have to if they’re from LOFT. But for small sized petites, there is a great place to find denim… I’m not sure what your size is though. For shirts, it’s usually easier to look in the regular sizes before the petite departments… that way you can find the right cuts, uncropped and full length sleeves… it just takes some searching to find the store that carries the sizes we need, but for basics, I go to H&M because the arm holes are smaller and the shirts fall in the perfect spot on my waist. I really like the column of color choice! I wear that look often and accessories with small bags and other accessories so that everything is proportional to my body size, because big accessories can tend to make our petite frames look even smaller! Thanks for this post! Loved it! Thanks for the awesome tip. Being only 5ft 3 myself, I will think about these tips during my next shopping spree. Any tips for a 4ft 9″ – size 12 person please? I have a book dedicated to petite dressing tips – it’s called Never Short on Style – and you can find it here https://www.insideoutstyleblog.com/ebooks-by-imogen-lamport/never-short-on-style/ Plus, if you type PETITE into the Search Bar at the top of the website, you will find everything I’ve written on the blog with petite tips. Do you have petite styles for women in their 60’s? Hi Joan – the concept remains the same – I’ve written a book about petite dressing – https://www.insideoutstyleblog.com/ebooks-by-imogen-lamport/never-short-on-style/ and the only difference is as you get older, is you want to think about a more sophisticated style – higher quality fabrics and construction, and avoiding those elements of style you associate with the very young – such as frills and flounces).